The Remington ThunderCeptor is the top model in the Remington air rifle range, with a powerful gas ram system at its centre. The Gas ram has several advantages over a standard spring and piston, the main one being that the gas ram doesn't lose power over time like a spring does with spring fatigue. Another is that as the Gas ram is a sealed unit, the shot to shot consistency is much better, improving shot grouping. The stock is constructed from a durable black synthetic polymer, with stippling to the fore end and pistol grip for a positive hold. 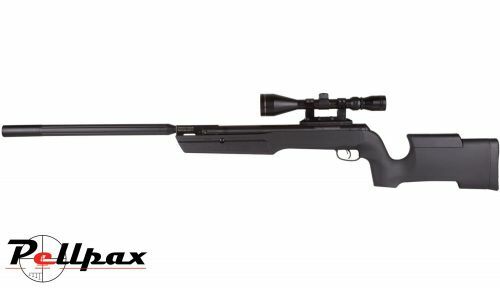 As well as this, the rifle is fitting with a bull barrel to reduce the muzzle report, making this your first choice for pest control, and hunting.